Increasingly smitten with soft, feminine hues and a monochromatic palette, our latest Look is like peering through rose-colored glasses. With eyes, lips, nails and cheeks within the same rosy color range, it’s la vie en rose. To add color and definition, apply Kevyn Aucoin’s The Neo-Bronzer to the apples of your cheeks. Gently blend the blush in a circular motion, sweeping it from cheekbones to temples. Continue to blend the pigment and build up the color until you’ve reached your desired hue. To create a subtle, cat eye effect, reach for BY TERRY Ombre Blackstar Cream Eyeshadow in Frozen Quartz. Sketch out a structured v-shape around the entire eye, layering the shadow until you’ve created a defined “wedge”. Next, use a fingertip to gently blur and soften the edges. The effect is an ultra-dreamy eye that’s both structured and soft. To fully unite the rose tones of the look, finish your makeup with a harmonious pink lip. We chose KEVYN AUCOIN The Sensual Lip Satin in Messaline, using a lip brush to create a more defined shape. Don’t be afraid to apply generously, giving lips a luminous, glossy finish. Add an element of polish to your look with a pink accent. Trim and file your nails into a short, oval shape, then apply a light base coat. Next, pick a rose that fits your mood from the Deborah Lippmann Bed of Roses Set. To make your mani last, finish with a top coat. Note: Let each application dry two minutes before adding the next. 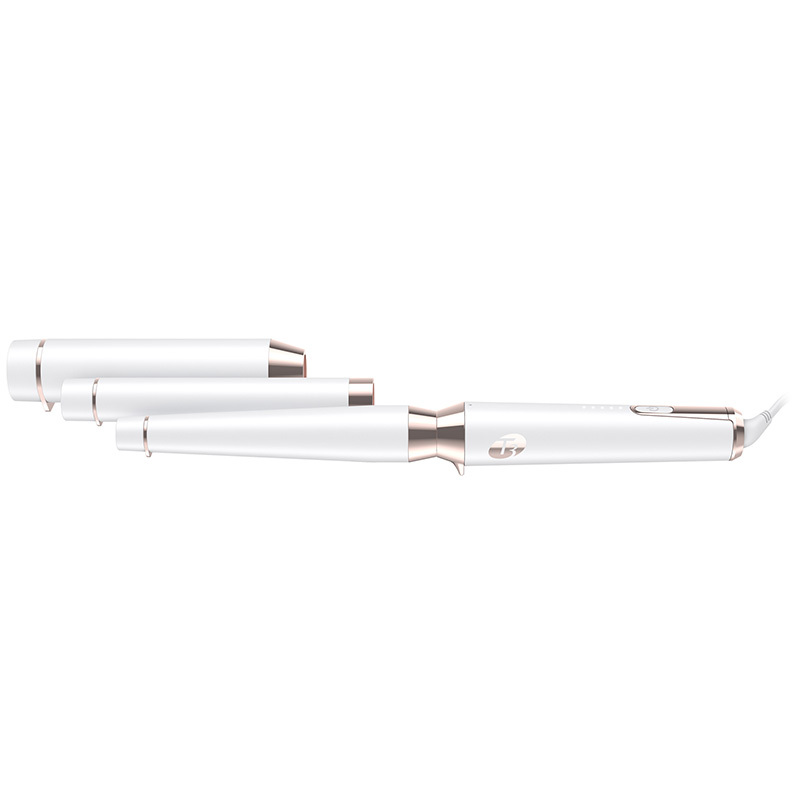 To create soft, bombshell waves, use the medium-sized barrel in the T3 Whirl Trio. Start at the ends of the hair, wrapping them away from the face. After you’ve curled your whole head, run fingers through hair to gently separate the coils. To really live la vie en rose, complete your outfit with luxe, gold accessories and complimentary pink hues. The effect is a memorable, monochromatic look that is anything but boring.